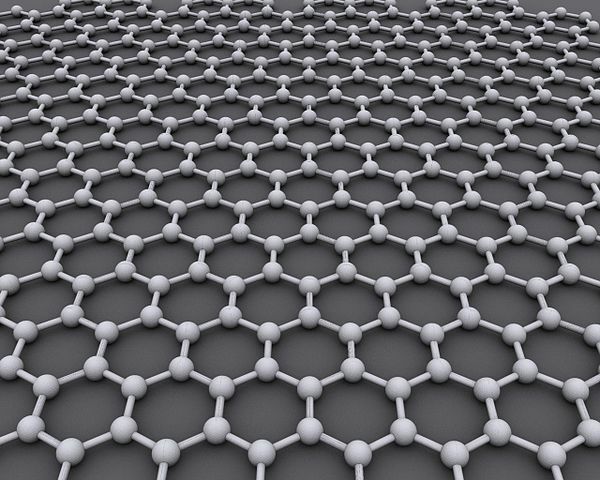 Carbon atoms forming a layer of graphene. Graphene is an allotrope of carbon consisting of carbon atoms arranged in a chicken-wire pattern in a layer only one atom thick. It has a variety of uses in electronics, plastics and batteries. One of the largest problems with working with graphene is preparing large amounts of it. Methods ranging from using adhesive tape pulling single layers from graphite to using sound waves to shake apart crystals. Researchers from Trinity College Dublin have found a unique and inexpensive solution. They found they could shear off large amounts of graphene sheets using little more than a kitchen blender, graphite and soapy water. A slurry of graphite and water is poured into a blender. A shearing force is created between the faster moving graphene particles passing through the blender blades and the slower particles outside the blades. This force is enough to slide strips of graphene off the graphite. A small amount of soap is added to the slurry to adhere to the 100- to 2,000-nanometer graphene strips to keep them from sticking to each other. This technique can be scaled up from laboratory tabletop to industrial levels. It can also be applied to other layered crystals such as boron nitride or molybdenum disulphide. It just goes to show, not all manufacturing techniques need to involve expensive machinery.